‘Captain Fantastic’ is a terrifically entertaining, moving and spirited film about a family who live unconventionally in the middle of a forest, led by their father, Ben, a man who believes in books and practical skills at the expense of generally perceived standard learning approaches. Ben is played by Viggo Mortensen and it’s hard to imagine anyone else in the role – he’s a loving, caring father with the utmost respect for his kids and their intelligence, but he’s also flawed and self righteous at times and his journey throughout ‘Captain Fantastic’ is one of many joys this film holds. The crux of the film’s narrative focuses on the family when a tragic event forces them to reintegrate into society after living in isolation for a decade, bringing Ben into contact with his wife’s father (Frank Langella), a man with polar opposite views on how the children should be brought up. The film is written and directed by Matt Ross, better known as an actor in the likes of the HBO series ‘Silicon Valley’ and films such as ‘Good Night, and Good Luck’, and it’s an outstanding piece of work, complex, thought provoking and deeply engrossing. In essence this is a family drama, but the setting and the premise adds some colour around the edges and allows the talented young cast the scope to explore their range. Since his role in the ‘Lord of the Rings’ series, Viggo Mortensen has largely avoided mainstream roles, choosing instead to star in a range of foreign and independent cinema and he is superb here. Ben is so wildly passionate about his family and his approach to their upbringing that you can’t help being swept along, but this isn’t a preachy or judgemental film and we spend time exploring both sides of the coin. Through Mortensen’s portrayal, we find ourselves both siding with Ben’s fiercely independent approach yet understanding of the very strong arguments against it. It’s hilarious when he advocates his methods in a scene with his sister’s two computer game obsessed boys, yet devastating when he reaches a point of realisation that maybe his approach doesn’t always work. 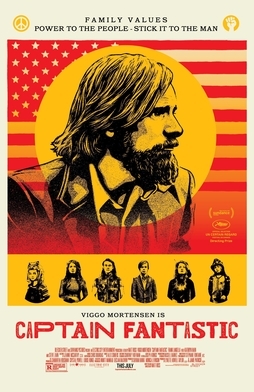 Mortensen covers a wide range of emotions throughout ‘Captain Fantastic’ with aplomb, and he’s never anything but understandable and likeable from a viewer’s perspective. The film is very funny and I laughed a lot, but it’s not afraid to lean into the deeper themes it’s trying to explore and Matt Ross manages to add a real emotional edge to his narrative. This is aided by a smartly chosen soundtrack that adds to the mood the film is attempting to create, punctuating and elevating key character moments. The questions Ross attempts to ask are big ones, focusing on the nature of family, bringing up children and individuality vs conformity, and its credit to his writing that the discussions and conclusions feel relevant and meaningful to the world we live in today. There’s occasionally a conflict between expanding on these weighty themes and in delivering a solid and sentimental family drama, but for the most part, ‘Captain Fantastic’ blends these two together into something both hugely entertaining and deeply provocative. ‘Captain Fantastic’ is one of the best American independent films of the year, led by Viggo Mortensen’s sensitive leading performance and an excellent script that leaves the audience to make up their own conclusions after leaving the cinema, and how refreshing is that?